Commonly known as jellyfish, jellies are not fish. The jelly consists of a transparent or translucent gelatinous-like umbrella and trailing tentacles. Jellies are free swimming and mostly found in marine areas, although a few are found in freshwater. They can swim alone, or in groups called blooms or swarms. The term Cnidaria comes from the Greek work for nettle (knide). Like nettles, jellies have the ability to sting. The sting comes from nematocysts (stinging capsules) which are in the tentacles. The nematocyst is used to paralyze prey, or ward off a threatening animal. It is harpoon-like and released from the tentacle in response to physical or chemical stimuli. The sting comes mostly from the way the tentacle attaches itself to the skin, although some can be in the pattern of touch from the diver. 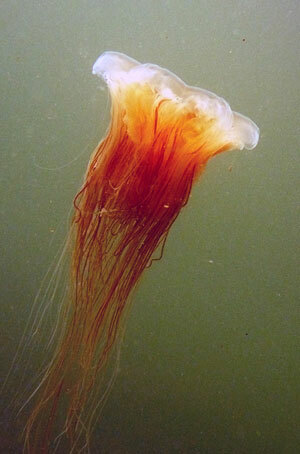 Red streaks and blisters are the commonest In British Columbia, most jelly stings are mild, other than from the Lion’s Mane jelly. The Lion’s Mane leaves a red blistery sting which can last for hours. British Columbia jelly stings are not fatal. It is important to understand that the tentacles can still sting when detached from the jelly, and even on dead jellies found on the beach. When treating a jelly sting, the tentacles need to be removed without activating the release of more of the nematoocysts. Bare hands will be stung so gloves and/or forceps should be used to remove the tentacles from the injured diver. The area should be irrigated with seawater. Fresh water or alcohol can trigger more release, and should not be used. 5% acetic acid (normal white vinegar) neutralizes the stinging cells. baking soda mixed to a paste with water, or 1/4 strength ammonia (1 part ammonia to 4 parts water). After the tentacles have been removed, and vinegar has been applied, shaving cream should be put over the area, and the area should be shaved with a razor or credit card. After shaving, apply more vinegar. An ice pack, steroid cream, antihistamine cream or local anaesthetic cream can help with the burning. Medical attention should be sought depending on the level of discomfort. As with most injuries, prevention is the best measure. In cold water, exposure usually isn’t an issue as the only unprotected skin is on the face. In warmer waters, appropriate protection should be worn, watch where you put your hands and don’t touch.